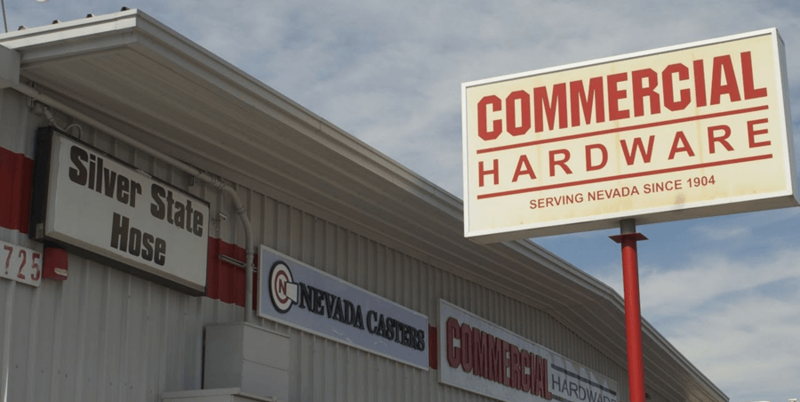 Commercial Hardware is family owned and operated, serving Nevada since 1904. Our helpful sales staff is here to assist you. In additional to our inside sales staff, Commercial Hardware also offers friendly and knowledgeable outside sales staff that will come to your place of business. As a convenience, we offer open accounts for business buyers with net 30 payment terms. Feel free to browse our website including our online catalogs. If you have any questions about our products, please call our knowledgeable sales associates at 702-736-0007. Commercial Hardware was founded in 1904 when J.E. Horgan opened Commercial Hardware on Commercial Row in Reno, NV. In the early 1900's Reno was a booming town more than doubling its population between 1900-1910. In the early years Commercial Hardware supplied equipment and general hardware to the mines and local businesses. In 1914, J.E. Horgan sold the business to his sons Jack, Tom & Bill. During that time Commercial Hardware grew along with the city and capitalized on the growing casino business, after the legalization of gambling in 1934. During these boom years, the Horgan brothers opened a second store in 1947 on East Fourth Street where it operated for the next 50 years. In 1977, Jack, Tom, and Bill continued a family legacy and sold the business to their sons, Pat and Dan Horgan. Over the years, Commercial Hardware enjoyed consistent growth and earned a favorable reputation in Reno for "hard to find" items and superior customer service. In 1995 the Horgans sold the business to the Wallner, England, and Hough families. In 1997, the decision was made to relocate Commercial to its current West Russell location in Las Vegas, NV. The next 15 years was a growth period for Commercial Hardware this time benefiting from being in the city of Las Vegas which was the fastest growing city in America. Also at this time, Commercial Hardware was actively acquiring industrial supply companies to its portfolio which included Silver State Hose, Nevada Casters, and Aztec Industrial Bearing and Supply. In 2011, Commercial Hardware launched their website, www.commercialhardwaregroup.com, in anticipation of further growth and to better serve the industrial supply market customer.